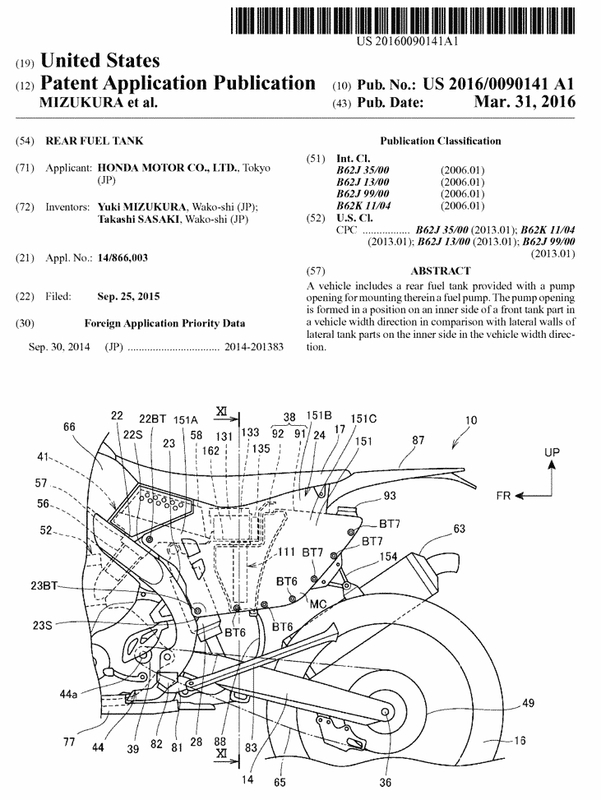 Honda just filed another new and interesting motorcycle patent this past week… This patent covers Honda using a rear-mounted fuel tank instead of the typical fuel tank area that is towards the front of the bike and right in your lap basically with your legs spread around it. Naturally, having the fuel tank up that high can affect how a motorcycle handles especially when you have a bike with a fuel tank that exceeds the 5-6+ gallon mark (1 gallon = 8.34 pounds). 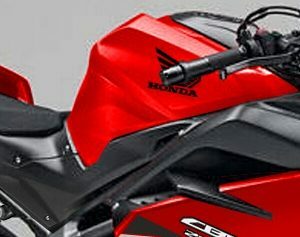 Honda has been experimenting with the idea of mounting the fuel tank in other areas (NC700X / NC750X / NC750S) to help better its “mass centralization” so all of the weight is in the middle of the bike and as low as possible which helps with its flick-ability and also helps make a motorcycle feel lighter than it truly is. Some may say, “What is interesting if Honda has used this technology in the past?”. 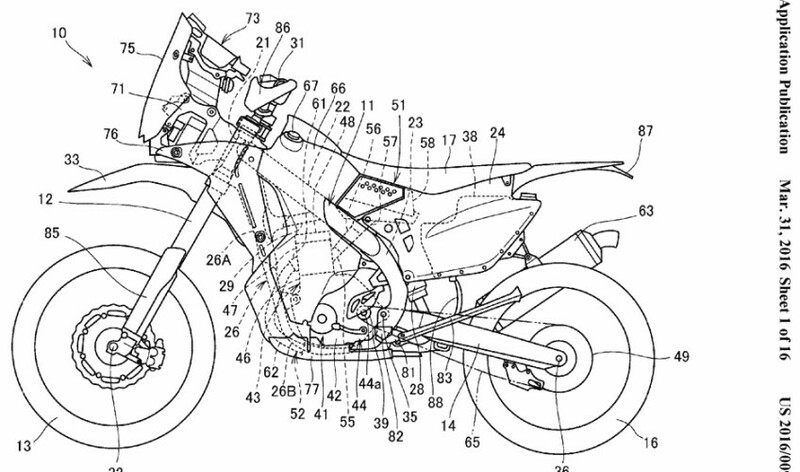 The bike in the patent documents… There’s been a lot of hype around the CRF250 Rally Concept that recently turned into a “Prototype” motorcycle. Could this technology make its way to the CRF250 Rally? The odds aren’t in that favor in my opinion as the CRF250 Rally seemed to share the majority of its parts with the CRF250L which makes sense as it would save Honda a pretty penny in development / R&D costs etc and Honda has been on the bandwagon lately with making multiple model variations out of one frame / engine / drive-train. This could of course be technology that only gets used on their race-bikes. It’s too early to know but it’s always interesting to see what Honda is up to and get a sneak peek at what may trickle down from Honda’s racing endeavors to their production motorcycles that you and I can buy. What do you think? Want to check out other new Motorcycle Technology Patents on what we might see on bikes in the future? Check them out by Clicking Here. The present invention relates to a rear fuel tank supported by a rear part of a vehicle body frame of a saddle-ride type vehicle. There is a saddle-ride type vehicle such as a motorcycle including a rear fuel tank provided to a rear part of a vehicle body frame. The rear fuel tank of this type is disclosed (for example, see JP-A No. S62-283084 (Patent Literature 1)), the rear fuel tank being configured such that as a shape using a space between the vehicle body frame and a rear wheel below the vehicle body frame, the rear fuel tank is formed into a U shape when viewed from above. When a rear fuel tank is formed into a U shape or an L shape when viewed from above, movement of a rear wheel cannot be prevented by the rear fuel tank when the rear wheel swings vertically. Therefore, a stroke of the rear wheel can be ensured. However, when a method for feeding fuel is intended to be changed from the existing type using a carburetor to a fuel injection system, there is such a problem that in the U-shaped or L-shaped rear fuel tank, a sufficient plane for mounting a fuel pump is less likely to be ensured. Embodiments of the present invention have been accomplished in view of the above-mentioned circumstances and an object of the present invention is to provide a rear fuel tank being provided for a saddle-ride type vehicle, the rear fuel tank being configured such that a plane for mounting a fuel pump is easily ensured and the fuel pump can be arranged without increasing a width of a tank. In order to address the above-mentioned problem, according to certain embodiments of the present invention, there is provided a rear fuel tank, the rear fuel tank being provided for a saddle-ride type vehicle including an engine, and a vehicle body frame that supports the engine. A swing arm extends rearward from the vehicle body frame and has a rear end with a rear wheel vertically swingably arranged thereat. The rear fuel tank is supported by a rear part of the vehicle body frame. The rear fuel tank includes a lateral tank part that is arranged on a lateral side of the rear wheel, and a front tank part that is arranged in front of the rear wheel and that is connected to a front side of the lateral tank part. In the rear fuel tank, a fuel pump is provided for feeding fuel in the rear fuel tank to the engine, and an opening is provided for mounting therein the fuel pump. The opening is formed in a position on an inner side of the front tank part in a vehicle width direction in comparison with a lateral wall of the lateral tank part on the inner side in the vehicle width direction. In certain embodiments, the fuel pump may be mounted to a fuel pump mounting part formed on an upper surface of the front tank part, and an upwardly swelling part that swells upward from the upper surface of the front tank part may be formed behind the fuel pump mounting part. In certain embodiments, the inside of the upwardly swelling part may be made to serve as a fuel space. Also, the upwardly swelling part may be formed to have a width larger than a width of the rear wheel. In some embodiments, a battery may be provided above the upper surface of the front tank part and in front of the upwardly swelling part. Also, the upwardly swelling part may swell upward beyond the battery. In certain embodiments, a battery tray may be provided for supporting the battery, and a front part of the battery tray may be supported by an air cleaner arranged in front of the battery. In some embodiments, the fuel pump may be offset to either a right side or a left side from a centerline of the rear wheel in the vehicle width direction. The battery may be arranged on the other side in order to prevent overlapping with the fuel pump mounting part when viewed from above. In certain embodiments, a recessed part that is recessed upward while avoiding a chain for transmitting driving force to the rear wheel may be formed in the bottom part on either a right side or a left side of the rear fuel tank. Also, the fuel pump may be arranged in a position located on the other side of the right side and the left side of the rear fuel tank and prevent overlapping with the recessed part when viewed from above. With certain embodiments of the present invention, the fuel pump is provided for feeding fuel in the rear fuel tank to the engine, and the opening is provided for mounting therein the fuel pump. The opening is provided in the position on the inner side of the front tank part in the vehicle width direction in comparison with the lateral wall of the lateral tank part on the inner side in the vehicle width direction. Therefore, a plane for mounting the fuel pump can be easily ensured, and the fuel pump can be arranged without increasing a width of the tank. For this reason, sealability between the rear fuel tank and the fuel pump can be ensured by a simple sealing structure. The fuel pump is mounted to the fuel pump mounting part formed on the upper surface of the front tank part, and the upwardly swelling part that swells upward from the upper surface of the front tank part is formed behind the fuel pump mounting part. Thereby, rigidity around the fuel pump mounting part is improved, and the sealability between the rear fuel tank and the fuel pump is more easily ensured. The inside of the upwardly swelling part is made to serve as the fuel space. Thereby, tank capacity can be increased. Also, the upwardly swelling part is formed to have the width larger than the width of the rear wheel. Thereby, mud or the like scattered from the rear wheel can be suppressed from being scattered to a front side. The battery is provided above the upper surface of the front upper part and in front of the upwardly swelling part. Thereby, the battery can be arranged using a dead space above the front tank part. The upwardly swelling part swells upward beyond the battery. Thereby, the mud or the like scattered from the rear wheel can be suppressed from intruding into the battery. The battery tray is provided for supporting the battery, and the front part of the battery tray is supported by the air cleaner arranged in front of the battery. Thereby, an exclusive member for supporting the battery tray can be reduced. The fuel pump is offset to either the right side or the left side from the centerline of the rear wheel in the vehicle width direction, and the battery is arranged on the other side in order not to overlap with the fuel pump mounting part when viewed from above. Thereby, the fuel pump and the battery can be arranged distributedly on the right side and the left side, and the battery can be arranged to be lowered. For this reason, the above-described structure contributes to lowering of the center of gravity. The recessed part that is recessed upward while avoiding the chain for transmitting driving force to the rear wheel is formed in the bottom part on either the right side or the left side of the rear fuel tank, and the fuel pump is arranged in the position located on the other side of the right side and the left side of the rear fuel tank and not overlapping with the recessed part when viewed from above. Thereby, the remaining amount of fuel that cannot be sucked by the fuel pump can be reduced. FIG. 2 is a view with a rear part of the motorcycle viewed from a left side. FIG. 3 is a view with the motorcycle viewed from a rear side. FIG. 4 is a perspective view of a rear fuel tank. FIG. 5 is a view with the rear fuel tank viewed from a left side. FIG. 6 is a view with the rear fuel tank viewed from a front side. FIG. 7 is a view with the rear fuel tank viewed from a rear side. FIG. 8 is a view with the rear fuel tank viewed from a lower side. FIG. 9 is a view with the rear fuel tank viewed together with a fuel pump from an upper side. FIG. 10 is a view showing the fuel pump and an internal structure of the rear fuel tank. FIG. 11 is a cross-sectional view showing the fuel pump together with a perimeter structure. FIG. 12 is a view with a rear frame viewed together with a perimeter structure from an upper side. FIG. 13 is a view with the rear frame viewed together with the perimeter structure from the front side. FIG. 14 is a view with the rear frame viewed together with the perimeter structure from the rear side. FIG. 15 is a view with the rear frame viewed together with the perimeter structure from the lower side. FIG. 16 is a view showing a battery tray together with a perimeter structure from a right side. A motorcycle according to certain embodiments of the present invention will be described below with reference to drawings. Note that in the explanation, description of directions such as front and rear, right and left, and upper and lower is the same as that in each direction with respect to a vehicle body unless otherwise especially described. Also, note that in each of the drawings, a reference sign FR is indicative of a front side of the vehicle body, a reference sign UP is indicative of an upper side of the vehicle body, and a reference sign LF is indicative of a left side of the vehicle body. FIG. 1 is a left side view of a motorcycle 10 according to certain embodiments of the present invention. The motorcycle 10 can be, in this example, a rally saddle-ride type vehicle configured in such a manner that a front wheel 13 is supported at a front end of a vehicle body frame 11 through a front fork 12, a rear wheel 16 is supported below the vehicle body frame 11 through a swing arm 14, and a seat 17 is supported above the vehicle body frame 11. The vehicle body frame 11 is a portion as a framework of the motorcycle 10, and is provided with a head pipe 21, a pair of right and left main frames 22, a pair of right and left center frames (also referred to as pivot frames), a rear frame 24, and a down frame 26. Note that the vehicle body frame 11 excluding the rear frame 24 is made of metal material, and the rear frame 24 is formed of resin material. The head pipe 21 composes the front end of the vehicle body frame 11, and the front fork 12 is steerably supported by the head pipe 21. The front fork 12 has an upper end attached with a handlebar 31, a lower end with the front wheel 13 supported through an axle 32, and an intermediate part in a longitudinal direction attached with a front fender 33 for covering the front wheel 13 from above. The pair of right and left main frames 22 linearly extends rearward and obliquely downward from the head pipe 21 in a side view. The pair of right and left center frames 23 extends downward from rear ends of the main frames 22, and supports the front end of the swing arm 14 in a vertically swingable manner through a pivot shaft 35. A rear cushion unit 28 is interposed between the swing arm 14 and the main frames 22. The respective center frames 23 are substantially arcuately curved so as to project rearward, so that the pivot shaft 35 is supported in a position situated nearer a lower side in relation to a portion curved most rearward. The rear wheel 16 is supported at a rear end of the swing arm 14 through an axle 36. The rear frame 24 is attached to the pair of right and left main frames 22 and the pair of right and left center frames 23, extends rearward with respect to these frames 22 and 23, supports the seat 17, and also supports a rear fuel tank 38. The down frame 26 is composed of a down frame upper part 26A composing an upper part, and a pair of right and left down frame lower parts 26B composing a lower part. The down frame upper part 26A extends substantially downward at a steeper angle than the main frame 22 from the head pipe 21. The down frame lower parts 26B extend from a lower end of the down frame upper part 26A so as to extend downward in the side view, and are branched into a right side and a left side. The right and left branched portions of the down frame lower parts are further curved, substantially horizontally extend rearward, and are connected to lower ends of the respective center frames 23. A reinforcing frame 29 directed in a front downward direction extends between the main frames 22 and the down frame upper part 26A, so that rigidity of a front part of the vehicle body frame 11 is increased. An engine 41 is supported on the main frames 22. The engine 41 is supported also on the center frames 23 and the down frame 26. Also, a pair of right and left front fuel tanks 66 storing fuel (liquid fuel) supplied to the engine 41 is supported on the main frames 22. The pair of right and left front fuel tanks 66 is formed as a large-sized fuel tank that extends downward from upper sides of the main frames 22 so as to cover both sides of the main frames 22, the down frame 26, and the engine 41. In rallying, the motorcycle travels a long distance. Therefore, the motorcycle is configured to ensure large tank capacity by the front fuel tanks 66 and the rear fuel tank 38. Note that a reference sign 67 is indicative of a fuel cap for closing filler openings for the front fuel tanks 66. A front stay 71 projecting forward is fixed to a front part of the head pipe 21. A headlight, rally equipment 73 such as a roadbook holder, a windshield 75 and the like are supported by the front stay 71. An upper part of the front fork 12 and an upper part of the down frame 26 are covered with a pair of right and left shrouds 76 from both sides. A front part and a lower part of the engine 41, and lower front sides of the front fuel tanks 66 are covered with a skid plate 77 so as to be protected. A rider\’s step 82 and a side stand 83 are supported below the center frames 23 through a step bracket 81. Also, in FIG. 1, a reference sign 85 is indicative of a pair of right and left fork covers for covering the lower part of the front fork 12 from a front side, a reference sign 86 is indicative of a grip guard for covering each grip of the handlebar 31 from the front side, a reference sign 87 is indicative of a rear fender for covering the rear wheel 16 from above, and a reference sign 88 is indicative of a mud guard arranged in front of the rear wheel 16. The engine 41 is provided with a crankcase 42, and a cylinder part 43 extending upward from a front upper part of the crankcase 42, and a transmission 44 is annexed to a rear part of the crankcase 42. The cylinder part 43 is provided with a cylinder block 46 attached to the crankcase 42, a cylinder head 47 attached to an upper end of the cylinder block 46, and a head cover 48 for closing an upper opening formed in the cylinder head 47. The cylinder block 46 has a lower part inserted into the crankcase 42, and is formed with a cylinder hole so that a piston (not shown) is vertically movably inserted therein. The cylinder head 47 has a rear surface connected with an intake device 51, and a front surface connected with an exhaust system 52. FIG. 2 is a view with a rear part of the motorcycle 10 viewed from a left side, and FIG. 3 is a view with the motorcycle 10 viewed from a rear side. The intake device 51 is provided with an intake pipe 55 extending rearward from the cylinder head 47, a throttle body 56 provided at a rear end of the intake pipe 55, and an air cleaner 58 connected to a rear end of the throttle body 56 through a connecting tube 57. The air cleaner 58 is supported on the center frames 23 by using a vacant space formed above the pair of right and left center frames 23 and the rear cushion unit 28 and below the seat 17. A front surface of the air cleaner 58 is arranged close to back surfaces of the front fuel tanks 66. The intake pipe 55, the throttle body 56, and the connecting tube 57 that are connected sequentially from the cylinder head 47 substantially linearly extend rearward and obliquely upward and are connected to the air cleaner 58. Referring to FIG. 1, the exhaust system 52 is provided with an exhaust pipe 62 having a tip end connected to an exhaust manifold 61 located at the front of the cylinder head 47, and a muffler 63 connected to a rear end of the exhaust pipe 62. The exhaust pipe 62 extends downward and obliquely forward from the exhaust manifold 61, is further curved rightward in a vehicle width direction and rearward, extends rearward along a right lower part of the vehicle body, and is connected to the muffler 63 on a right side of the swing arm 14. An output shaft 44a of the transmission 44 is attached with a drive sprocket 39. A chain 65 is laid between the drive sprocket 39 and a driven sprocket 49 provided integrally with the rear wheel 16, and driving force is transmitted from the transmission 44 to the rear wheel 16. FIG. 4 is a perspective view of the rear fuel tank 38. The rear fuel tank 38 is provided with lateral tank parts 91 that are provided on a right side and a left side at intervals, and a front tank part 92 that is arranged in front of the lateral tank parts 91 and that is connected to front sides of the lateral tank parts 91. The rear fuel tank 38 is formed into a U-shaped fuel tank opened toward the rear side when viewed from above. The rear fuel tank 38 is formed into the U-shaped tank. For this reason, the lateral tank parts 91 can be arranged lateral to the rear wheel 16, the front tank part 92 can be arranged in front of the rear wheel 16, the rear wheel 16 can be moved forward/backward between the lateral tank parts 91 when the rear wheel 16 is upwardly moved by swinging of the swing arm 14, and a moving stroke of the rear wheel 16 can be sufficiently ensured. The rear fuel tank 38, can be, in this example, a resin tank manufactured by molding resin material. The rear fuel tank 38 is manufactured as follows. A cover 38A integrally provided with the upper parts of the lateral tank parts 91 and an upper part of the front tank part 92, and a tank body 38B forming an upwardly opened vessel portion excluding the upper parts of the lateral tank parts 91 and the upper part of the front tank part 92 respectively, are respectively manufactured by performing injection molding with respect to the resin material. Then, the cover 38A and the tank body 38B are made to adhere to one another or are thermally welded. Note that a method for manufacturing the rear fuel tank 38 is not limited to the above-described method. Other methods, for example blow molding, may be applied. FIG. 5 is a view with the rear fuel tank 38 viewed from a left side. FIG. 6 is a view with the rear fuel tank 38 viewed from a front side. FIG. 7 is a view with the rear fuel tank 38 viewed from a rear side. FIG. 8 is a view with the rear fuel tank 38 viewed from a lower side. Note that the rear fuel tank 38 has a substantially symmetric shape except for the filler opening and a chain relief (a recessed part 91W described later). As shown in FIG. 4 to FIG. 8, the front tank part 92 is formed into a hollow box shape provided with a front surface part 92A, a bottom surface part 92B, an upper surface 92C, right and left lateral surface parts 92D composing lateral surfaces (side walls) on an outer side in the vehicle width direction, and a back surface part 92E. The front surface part 92A is formed to have a surface extending in a vertical direction of the vehicle body and bridging between front edges of the right and left lateral surface parts 92D. As shown in FIG. 6, a plurality (six in total in this example) of fastened parts NT1 (female screws in the present structure) for fastening to a front cross part 153 described later of the rear frame 24 are provided in the vicinity of an upper edge of the front surface part 92A and in the vicinity of a lower edge thereof at intervals in a horizontal direction and the vertical direction. The bottom surface part 92B is formed to have an inclined surface inclined gently rearward and upward. As shown in FIG. 8, the bottom surface part 92B is provided with a plurality (three in total) of fastened parts NT2 (female screws in the present structure) for fastening to a lower part of the front cross part 153 described later, the fastened parts NT2 being formed at intervals in the horizontal direction. As shown in FIG. 5 and FIG. 6, the upper surface 92C of the front tank part 92 is provided integrally with a front upper surface part 92CF extending substantially horizontally from an upper edge of the front surface part 92A, and an upwardly swelling part 92CR swelling upward from a rear edge of the front upper surface part 92CF. A front surface 92CR1 of the upwardly swelling part 92CR is formed into a surface (vertical surface) parallel to the vertical direction of the vehicle body, an upper surface 92CR2 thereof is formed into a surface (horizontal surface) substantially horizontally extending rearward of the vehicle body, and right and left lateral surfaces 92CR3 are formed into surfaces extending parallel to the longitudinal direction of the vehicle body on an inner side in the vehicle width direction in comparison with lateral surfaces (outer surfaces described later) on the outer side in the vehicle width direction of the lateral tank parts 91. A plurality of fastened parts NT3, NT4, NT5 (female screws in the present structure) for fastening to an upper cross part 152 described later of the rear frame 24 are respectively provided to the front surface 92CR1, the upper surface 92CR2 and the lateral surfaces 92CR3 of the upwardly swelling part 92CR. As shown in FIG. 4, FIG. 7, and FIG. 8, the back surface part 92E of the front tank part 92 is formed into a curved surface that is curved into a forwardly projecting U shape, so that a substantially constant clearance is ensured between the back surface part 92E and the rear wheel 16 entered between the right and left lateral tank parts 91. A mud guard mounting part 92T for mounting the mud guard 88 from behind is provided to a lower part of the back surface part 92E. The mud guard 88 is mounted to the mud guard mounting part 91A through fastening members 88BT (fastening bolts in the present structure). As shown in FIG. 6 and FIG. 8, the right and left lateral surface parts 92D of the front tank part 92 are formed into inclined surfaces spreading outward in the vehicle width direction from the right and left side edges of the front surface part 92A toward the rear side of the vehicle body. In the present structure, as shown in FIG. 5 and FIG. 6, lower edges of the right and left lateral surface parts 92D are formed into bent surfaces MA that are gently inclined to an inner side of the vehicle body and that are coupled to the bottom surface part 92B. As viewed from the front side of the vehicle body, the bent surfaces MA are formed into inclined surfaces that are inclined downward on the inner side in the vehicle width direction. The respective bent surfaces MA are provided with a plurality (three in FIG. 5) of fastened parts NT6 (female screws in the present structure) that are provided for fastening to side panel parts 151 described later of the rear frame 24 and that are respectively provided at intervals in the longitudinal direction. The lateral tank parts 91 are provided integrally with bottom surface parts 91B, upper surface parts 91C, right and left lateral surface parts 91D (hereinafter referred to as outer surface parts) composing lateral surfaces (side walls) on the outer side in the vehicle width direction, and right and left lateral surface parts 91U (hereinafter referred to as inner surface parts) composing lateral surface (side walls) on the inner side in the vehicle width direction. The bottom surface parts 91B of the lateral tank parts 91 are formed to have inclined surfaces that are continuous with the rear edge of the bottom surface part 92B of the front tank part 92 and that extend upward to the rear at the steeper angle than the bottom surface part 92B. The taillights 89 are respectively mounted to the right and left bottom surface parts 91B. Note that in FIG. 7, a reference sign 89BT is indicative of each of fastening members (fastening bolts in the present structure) for fixing the taillights 89. The upper surface parts 91C of the lateral tank parts 91 extend rearward while being continuous with the rear edge of the upper surface 92C (including the upwardly swelling part 92CR) of the front tank part 92, and are connected to the rear edges of the bottom surface parts 91B. As shown in FIG. 4 and FIG. 5, the upper surface parts 91C of the lateral tank parts 91 are provided in relatively high positions in the rear fuel tank 38, the filler opening is formed in the position of one (right side) of the right and left lateral tank parts 91 at the rear end of the upper surface 92C, and the filler opening is closed with a fuel cap 93. The outer surface parts 91D of the lateral tank parts 91 are formed with respect to the side walls that are continuous with the rear edges of the right and left lateral surface parts 92D of the front tank part 92 and that extend rearward of the vehicle body, and an extending direction thereof is substantially parallel to the longitudinal direction of the vehicle body. With regard to the outer surface parts 91D, in the same way as the right and left lateral surface parts 92D of the front tank part 92, the lower edges of the outer surface parts 91D are formed into bent surfaces MB that are gently inclined to the inner side of the vehicle body and that are continuous with the bottom surface parts 91B. As viewed from the front side of the vehicle body, the bent surfaces MB are formed into inclined surfaces that are inclined downward on the inner side in the vehicle width direction. The bent surfaces MB are also formed with a plurality (three in FIG. 5) of fastened parts NT7 (female screws in this example of the present invention) for fastening to the side panel parts 151 of the rear frame 24. In this way, in the rear fuel tank 38, as shown in FIG. 5, the bent surfaces MA, MB are provided, the bent surfaces being continuous with each other along the lower edges on the outer side in the vehicle width direction. The bent surfaces MA, MB are provided with the plurality of fastened parts NT6 and NT7 that are formed of the female screws and provided at intervals. As shown in FIG. 8, the inner surface parts 91U of the lateral tank parts 91 are formed with respect to side walls that are continuous with the rear edge of the forwardly projecting back surface part 92E of the front tank part 92 and that extend rearward of the vehicle body, and the extending direction thereof is substantially parallel to the longitudinal direction of the vehicle body. For this reason, the clearance between the inner surface parts 91U of the lateral tank parts 91 and the rear wheel 16 can be kept constant. As shown in FIG. 7, in the lateral tank part 91, the recessed part 91W that is recessed upwardly is formed in a region opposed to the chain 65 (FIG. 2 and FIG. 3) as a power transmission member for transmitting the driving force to the rear wheel 16. The recessed part 91W extends in the longitudinal direction over the inner surface part 91U and the bottom surface part 91B of the left lateral tank part 91, and also a reinforcing rib is provided in the region with the recessed part 91W formed. For this reason, a sufficient clearance can be endured between the recessed part 91W and the chain 65, and also the region opposed to the chain 65 can be reinforced. As shown in FIG. 4, the upper surface 92C of the rear fuel tank 38 is provided with a pump opening 96, and fuel pump mounting parts 97 (female screws in the present structure, see FIG. 4) provided around the pump opening 96 at intervals. More specifically, the pump opening 96 is a hole that is formed in the front upper surface part 92CF of the front tank part 92 and that is opened upward, and the fuel pump mounting parts 97 are the female screws that are formed at constant intervals along the outer edge of the pump opening 96. A fuel pump 111 (FIG. 9) is mounted using these pump opening 96 and fuel pump mounting parts 97. A perimeter structure including the fuel pump 111 will be described below. FIG. 9 is a view with the rear fuel tank 38 viewed together with the fuel pump 111 from an upper side, FIG. 10 is a view showing an internal structure of FIG. 9, and FIG. 11 is a cross-sectional view (equivalent to the cross-sectional surface taken along line XI-XI) showing the fuel pump 111 together with the perimeter structure. Note that in FIG. 11, a reference sign LC is indicative of a centerline in the vehicle width direction. As shown in FIG. 9 to FIG. 11, the fuel pump 111 is provided integrally with a pump unit 111A (FIG. 11) having a vertically long cylindrical shape, and a flange part 111B extending outward in a radial direction from an upper part of the pump unit 111A. The pump unit 111A is inserted into the pump opening 96, and the flange part 111B is formed to have a diameter larger than that of the pump opening 96 and is fastened to the fuel pump mounting parts 97 through a plurality of fastening members 97BT (fastening bolts in the present structure). For this reason, with the pump unit 111A arranged in the front tank part 92, the fuel pump 111 is fastened and fixed to the front tank part 92. The pump unit 111A extends downward toward the bottom surface part 92B of the front tank part 92, and has a strainer (also referred to as a filter unit) 111C (FIG. 10) provided at a lowermost end of the pump unit 111A. The pump unit 111A is configured such that the fuel in the rear fuel tank 38 is sucked through the strainer 111C, so that the fuel is sucked while removing foreign matter and is delivered at a predetermined pressure. The flange part 111B is provided with a fuel discharge pipe 111D projecting upward, and the fuel delivered by the pump unit 111A is discharged to the outside through the fuel discharge pipe 111D. The fuel discharge pipe 111D is connected with a fuel pipe 112, and the fuel is fed to a fuel supply system of the engine 41 through the fuel pipe 112.